Submerge yourself in the endless possibilities of visual art this summer. 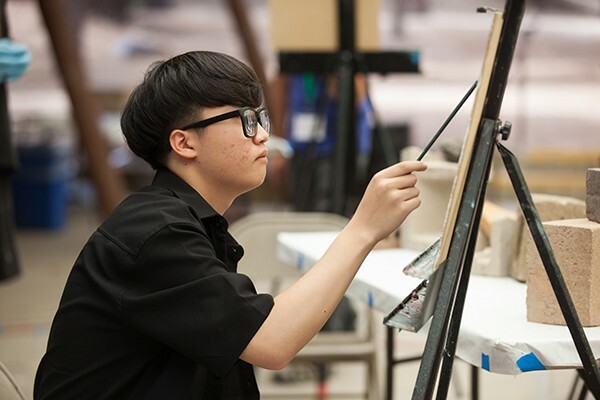 Whether your preferred medium is 2D or 3D, students will grow and gain confidence in their artistic expression while creating new, originals works. 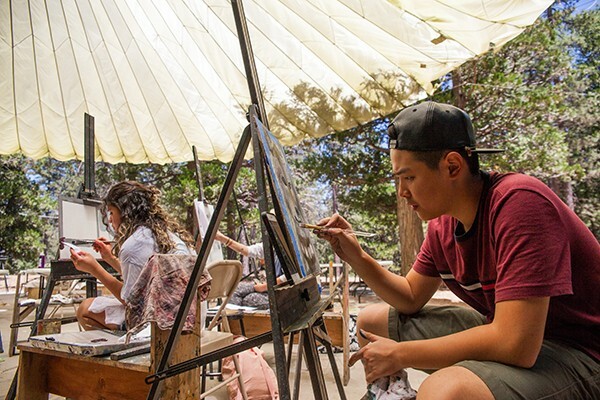 Experiment with different techniques and methods offered by our dynamic faculty, all while expanding your artistry under inspirative pine trees. Students will explore the infinite possibilities of construction and composition alongside a diverse class of like-minded young artists. 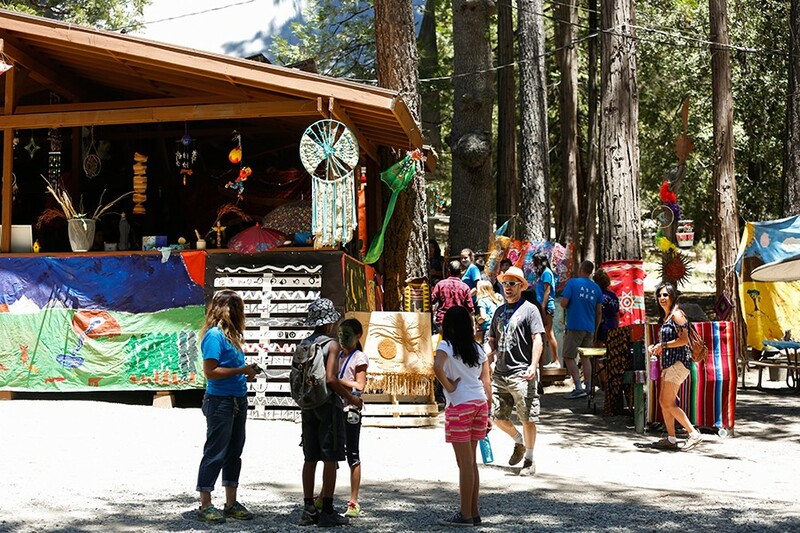 This is a summer art camp for the explorer and dreamer. Combining and flowing through mediums, from collaborative drawing and plein air painting, to mixed media collage and sculpture, students are given the space to reflect on the wonders of the world within and around us. Group discussions and prompted writing exercises support students to construct meaningful dialogue surrounding their projects. 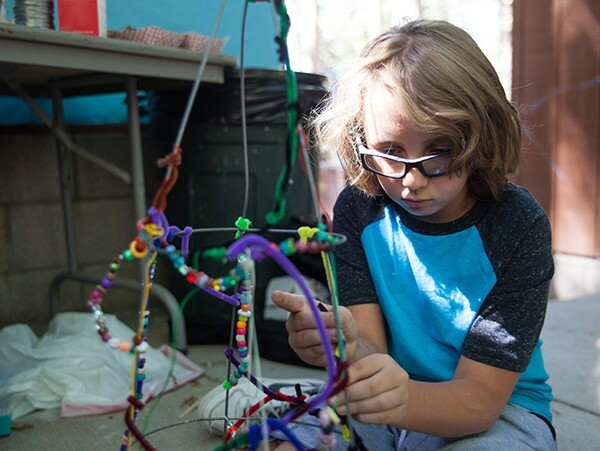 We emphasize the joy of building and exploration while challenging ourselves to engage with materials and ideas of all kinds using multiple methods of construction. Saturday, August 3, 2019 – 9:30 a.m.
Explorers. Students will be explorers of cultures, material, subjects, techniques and friendships. A feeling of community is created while the students create together, as they learn and grow together. We will find inspiration while we look at different cultures around the world, discovering the beauty created everywhere. We will be working with a variety of materials and subjects, looking at not only the art but also the stories and music of different lands. Some of the projects we will explore will be drawing dragons inspired by Japanese wood cuts, collaged travel journals that the students can use throughout our time together and beyond to record their thoughts and ideas, simple loom weavings and dream catchers, clay pinch pots and animal figures to name just a few. 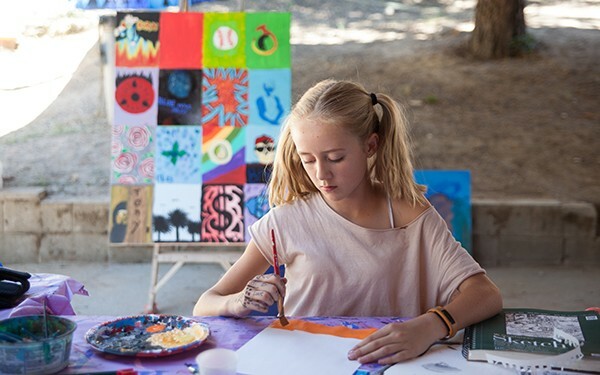 In this art camp students will be empowered to create, learning a variety of art skills and become connected with the beauty in the world. 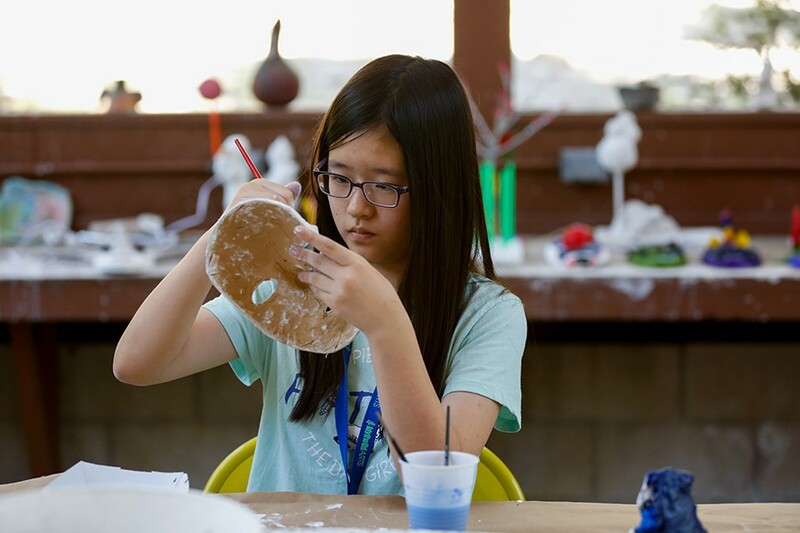 Saturday, July 13, 2019 – 9:30 a.m.
See your world in new ways as you spend half of each day learning drawing and the other half learning sculpture. Drawing will help you explore new ways to look at your surroundings. 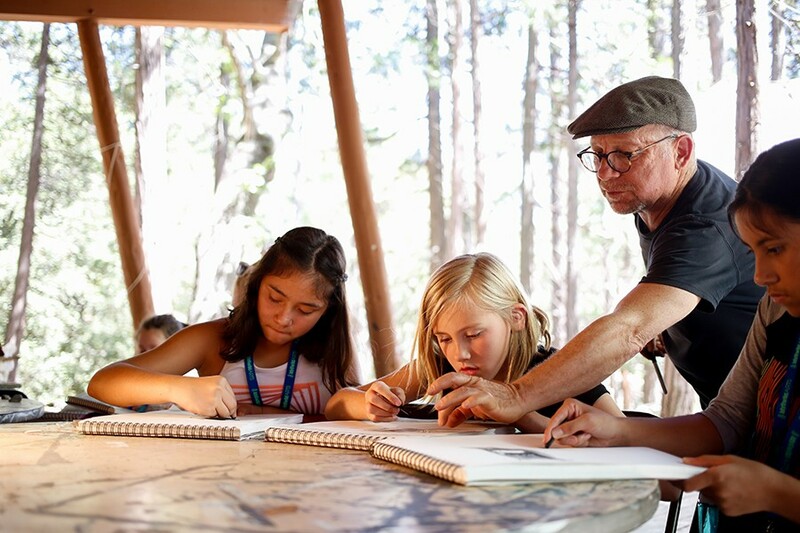 As you walk through the woods, you will discover how to reflect it by drawing, sketching other students, and looking at great master drawings. You will learn to express movement, volume and depth, and how to use the expressive powers of drawing through line, shading, and even scribbling. Exercises and activities will guide you toward your own artistic and creative self. 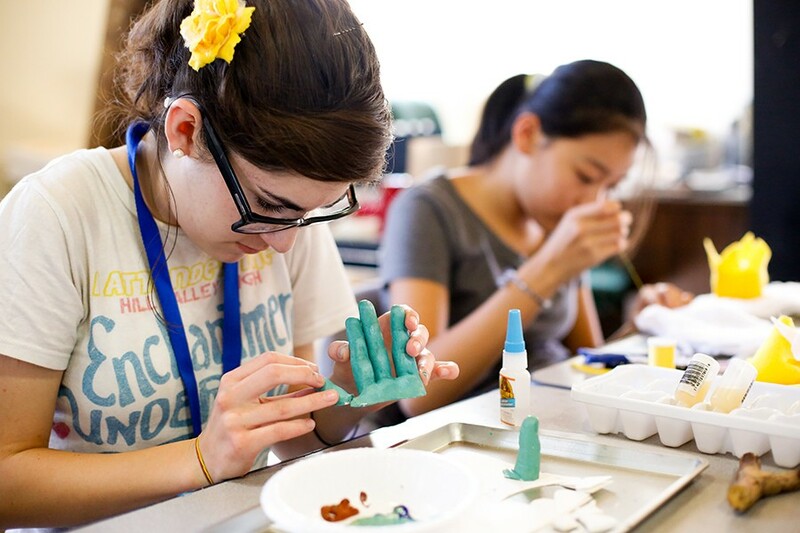 Then expand your understanding of sculpture design while creating unusual and imaginative three- dimensional art. In this summer art camp you will learn how to use relationships, size, texture, and positive and negative space to express your ideas. 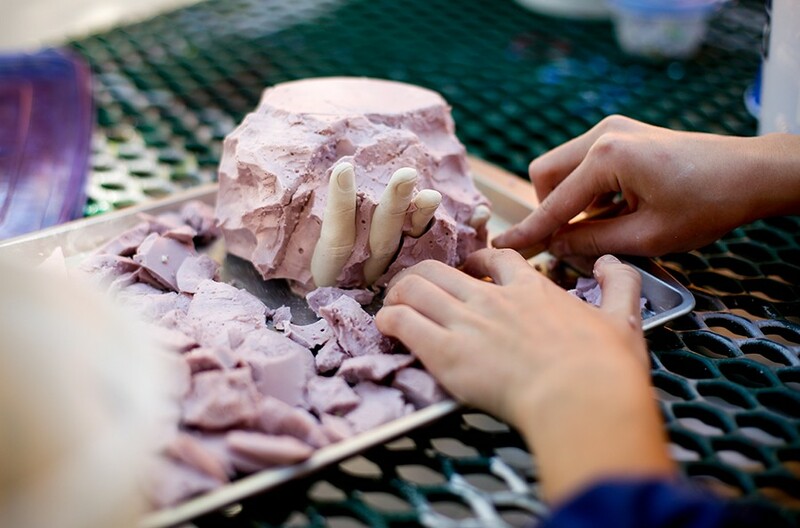 Build with wax, clay, plaster, wire, wood, and papier-maché. Draw inspiration for your unique structures from organic forms and natural materials from the forest. Be prepared for fun in the third dimension. Saturday, July 20, 2019 – 9:30 a.m. Spend half of each day discovering the secrets of modern art, and the other half putting your imagination to work creating your own artistic masterpieces. 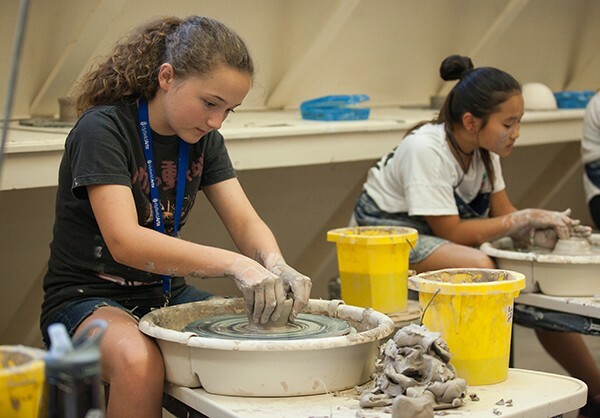 During this summer art camp you will take a journey into the magical world of 20th century painting and sculpture. Look at the radical and experimental work of modern masters such as Picasso, Matisse, Pollack, Nevelson and more, then use what you learn to make your own versions of each artist’s work. Learn to make shadow boxes, go wild with paint, and assemble collages. Have fun with materials while getting a glimpse into the imaginations of great artists. Then explore a variety of hand-building techniques used in ceramic and plasterwork. You will learn experimental and traditional processes. Find out how to use pinching, coiling, slab work, and carving to create sculptural forms inspired by a variety of modern artists. Artists and architects such as Gaudi, Claus Oldenburg, Georgia O’Keeffe, and Henry Moore will serve as both creative springboards and inspiration for your individual art. This is a two-week 3D art extravaganza where we will explore the world of ceramics! 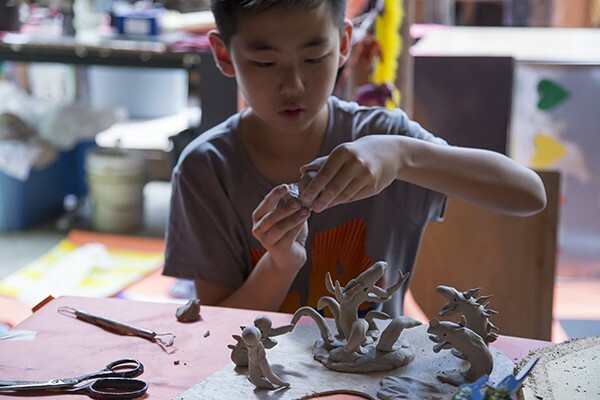 An art camp in which you will learn various techniques for forming clay to create pottery and sculpture. Then you will focus on techniques for applying glazes and firing the work using high- temperature gas kilns, mid-temperature in electric kilns, and soda firing with the possibility of raku firing and horsehair firing. In this instructive and fun workshop you will receive individual instruction, group interaction, and creative growth regardless of your level of experience. 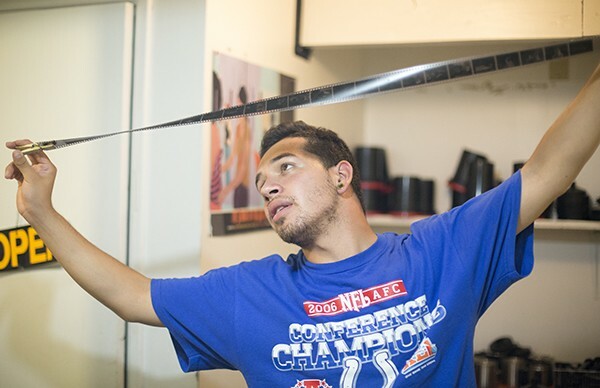 You may bring your own tools, but studio tools are available for use. Bring your old clothing for this fun and messy workshop! Lab fee includes all clay and firing materials. 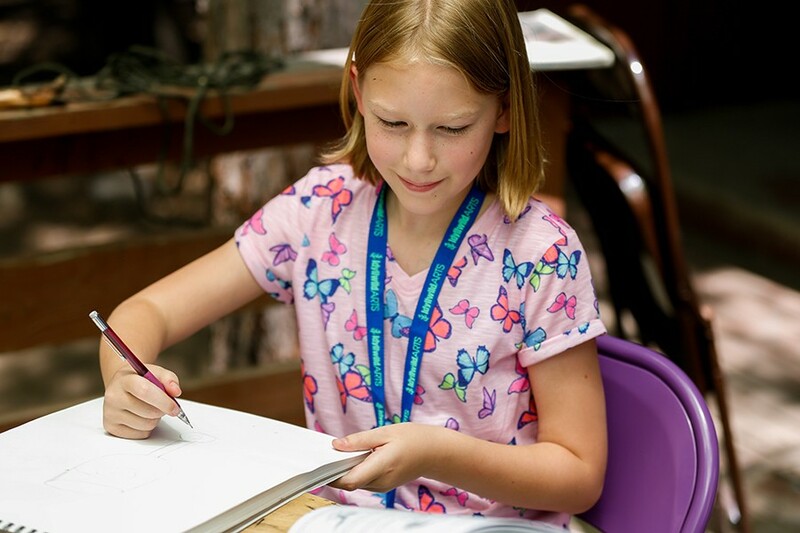 Explore the wonders of art in this fun and exciting combination summer camp! Discover traditional and non- traditional ways to create and think about art. Use your own creativity to develop your own style. Colin Smith and Saffron Symank will team teach this class for a more well-rounded art experience. Each teacher comes from a different background, and brings unique-yet- complimentary artistic perspectives. 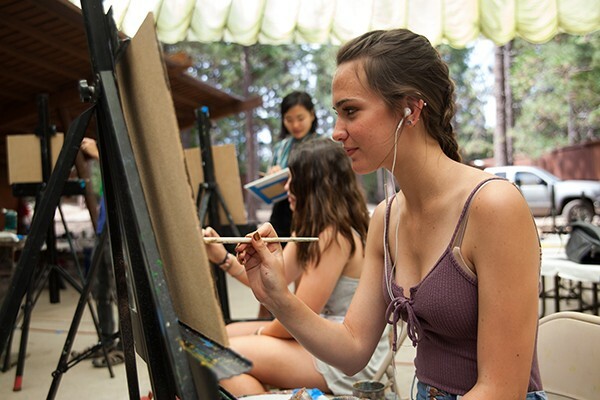 You will learn acrylic and watercolor painting, graphite and charcoal drawing, pen and ink, oil pastels, contour drawing, color mixing, portrait projection, grids, batik, mixed media and collage, figure drawing, and plein air sketching. You should be open and willing to try new techniques and to use different materials. Use your talent and commitment to art as your springboard to grow as artists and enjoy your own creative process. Plan to bring paint brushes, a 9”x12” pad of Bristol paper, a set of varying hardness graphite pencils, and a pencil sharpener. 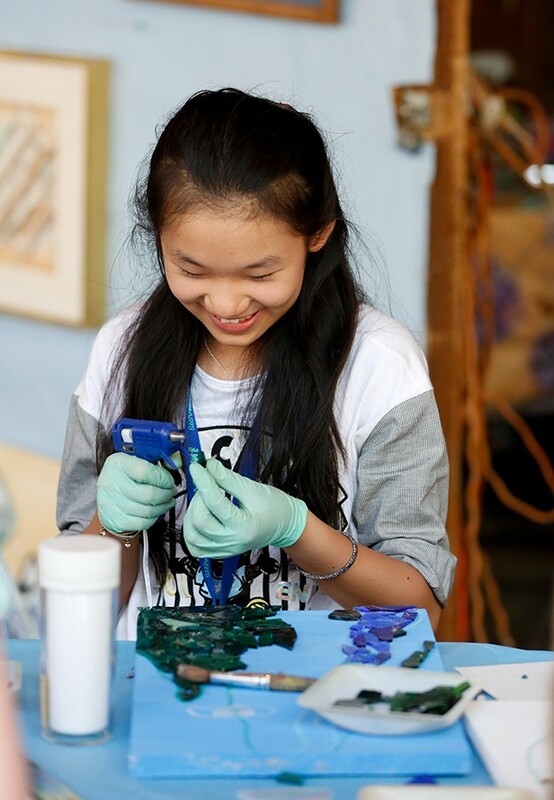 Imagine, play, create and discover your own magic as you explore techniques and materials from across the world of art! 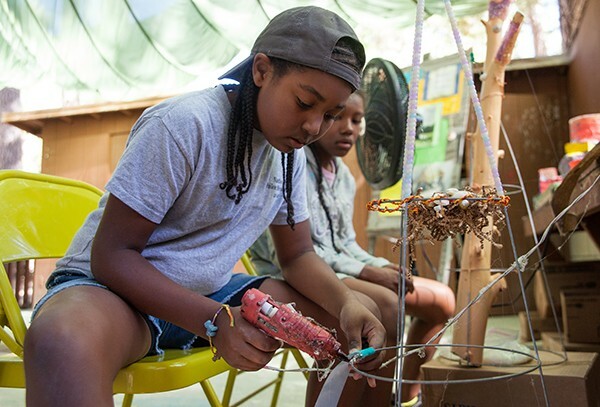 Create tree houses from found wood, explore the world through the lens of a digital camera, and learn to capture still life on canvas using acrylics and oils. 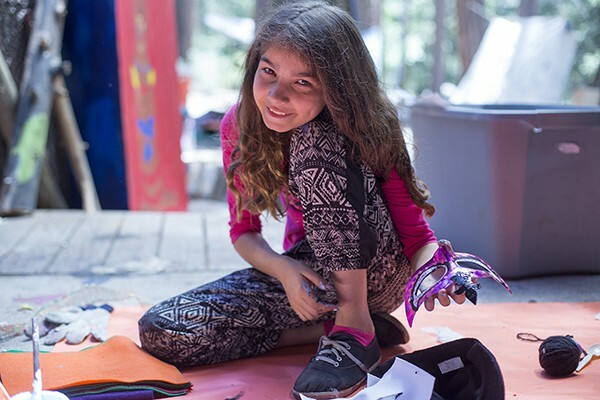 Discover how to express yourself in everyday objects by batiking shirts and skirts using natural dyes, and creating sculptures from stained glass, beads, found objects, bendable aluminum, wood, and thick wire. 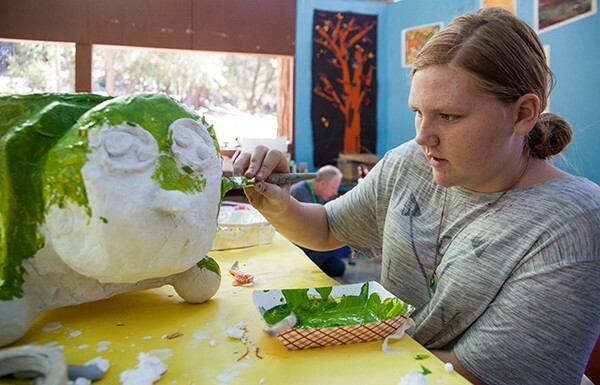 Explore the mysteries of mask-making using papier maché. Learn the many processes of printmaking, from wood-cut block mono prints to collagraphs (collage and printmaking combined). Use your imagination to create wall-sized murals. Discover how to use your imagination to turn your life into art! 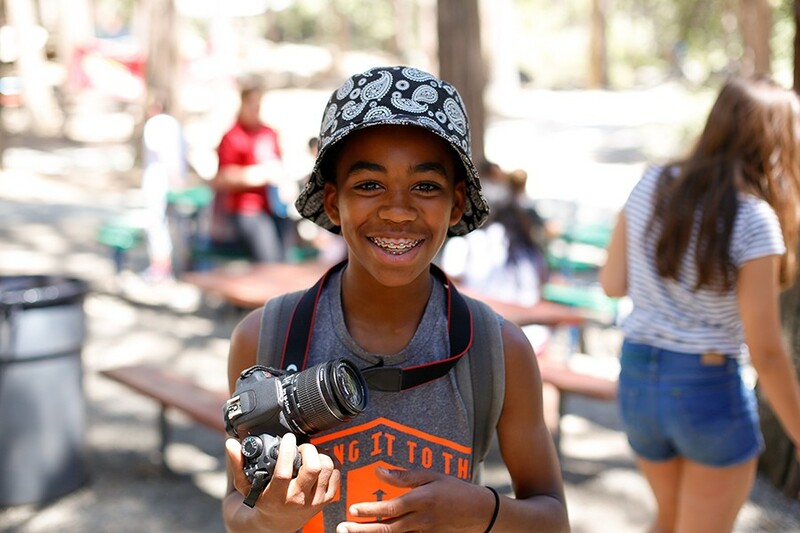 For this summer photography camp, plan to bring a digital camera, batteries, charger and instruction manual (if available), USB thumbdrive, 25 sheets of ink jet photo paper (luster or glossy surface), and water bottle. Your lab fee includes all printing supplies. 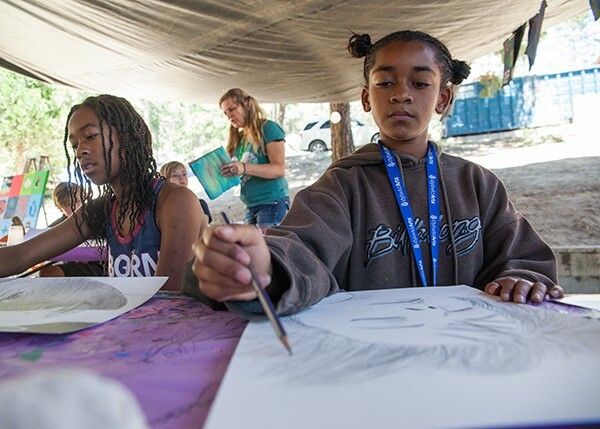 Whether or not you consider yourself an artist, this summer art camp will help you grow and gain confidence. Spend two weeks playing, learning, experimenting, and stretching as you experience the joy of creating art. Projects will include both 2D and 3D creations, using a variety of materials and techniques. Explore, experiment and discover the infinite possibilities that arise when you are given opportunity to just have fun. 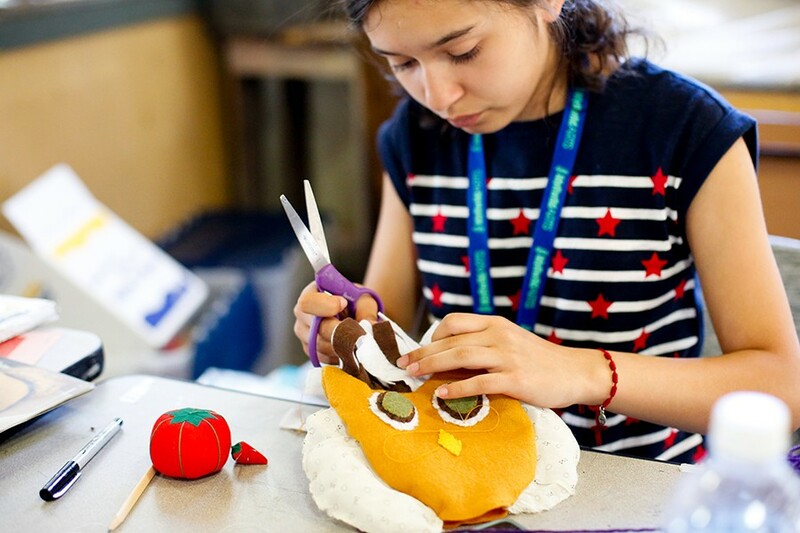 Projects will incorporate color and design instruction including sculpture, painting, drawing, silk painting, basketry, creating musical instruments, fabric art, bookmaking and found object assemblage. Expect individual instruction to support your own level of confidence, talent and skill development. 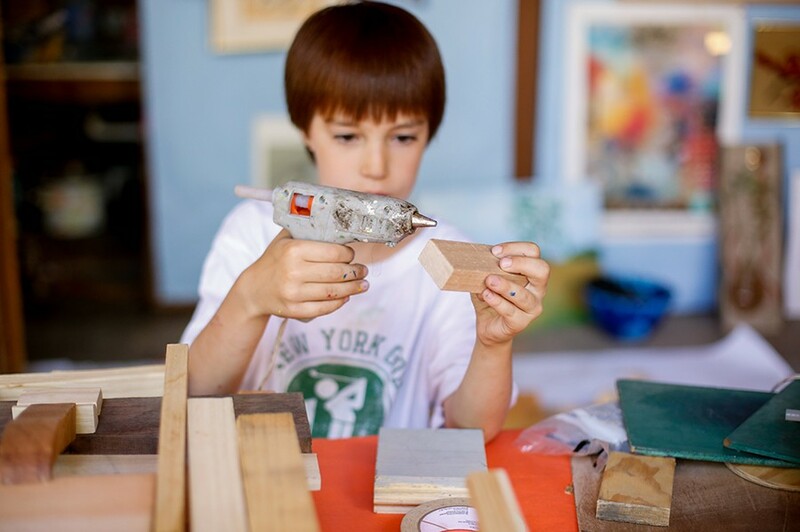 Your workshop will culminate in an art exhibit, allowing you to show off your talents to family and friends. 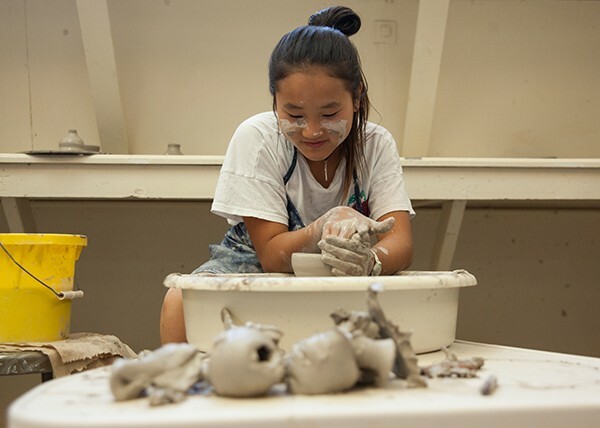 This studio-focused intensive summer art camp is a two-part 3-D art experience designed to build your vocabulary in ceramics. 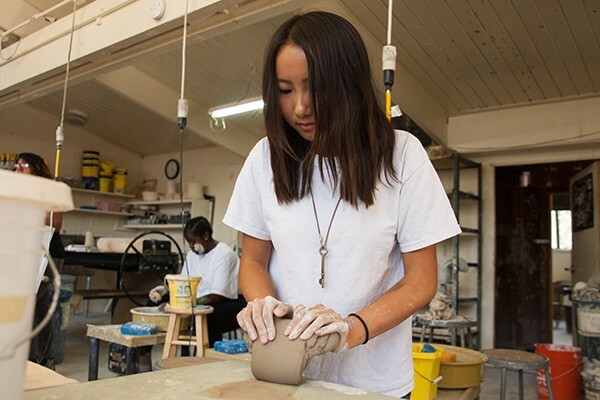 In your first week, you will focus on methods of construction, with the primary emphasis on the potter’s wheel. In your second week, you will examine glazing and firing, learning techniques such as high- temperature reduction (gas kiln), mid-temperature oxidation (electric kiln), and soda firing, with the potential for raku and horsehair firing. This intensive gives you excellent opportunities for individual instruction, group interaction, and growth, whether you are a beginning or advanced student. 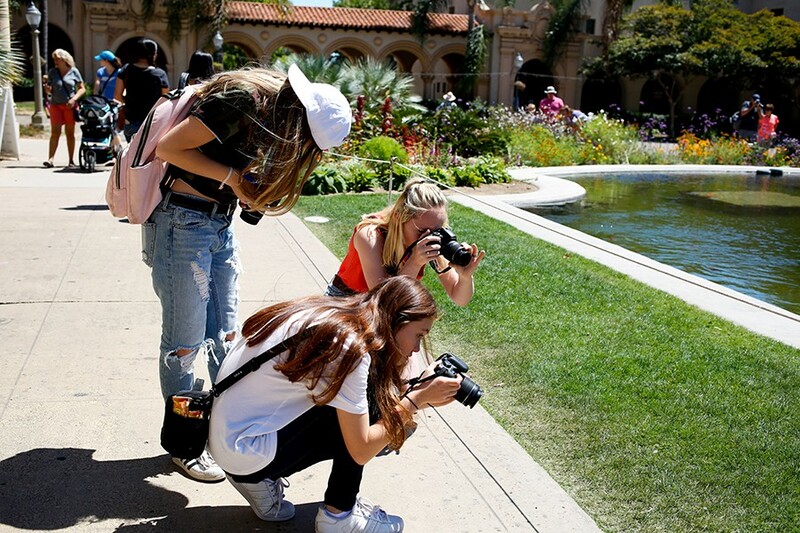 Saturday, July 6, 2019 -10 a.m.
Beginning with the Basics – This exciting photography camp covers the fundamental techniques of photography, from camera handling to the finished print. Introduction to the camera includes exposure calculations, image control, and learning to see. Your field trips and shooting assignments will be followed by extensive work in post-production techniques to enhance your images for quality printing and viewing. You will explore visual concepts in photography, such as the frame, composition, light, time and the moment. Advancing Your Techniques – Your second week will challenge you to see beyond the basics, including night photography. Explore ways of interpreting the world through photographs so your images reflect what you feel and see. Explore the aesthetics of photography through slides, books, discussions and extensive individual and group critiques and workshop assignments. Enhance your technical knowledge and clarify your goals as a photographer, enabling you to develop a new sense of direction and purpose. Plan to bring a 35mm digital camera and additional lens (fixed 35mm or 50mm would be best), two camera batteries plus chargers, two or more 4 GB media cards, and a tripod (optional). Learn the fundamental approach, techniques, and concepts of drawing and painting. Drawing will be taught almost exclusively using the human figure as a means of investigating line, contour, negative space, volume, light, and composition using a wide array of media. Concurrently, you will focus in painting on the mechanics of working in oil paint with use of the human figure, landscape, still life, and photographic imagery as subject matter. In this summer art camp you will complete at least three to six paintings. Investigate various ideas and considerations regarding art in both historical and contemporary terms. The studio will be open during the evening so you may work on projects outside of class. Plan to bring two Bristol vellum pads (24” x 18”), one newsprint pad (24” x 18”), and any brushes you prefer. Structured much like Intensive I, (see above) but if you are a continuing student expect to broaden your experience with the option of individual projects. All drawing will be done using a live model to investigate aspects of light, volume, composition, and line quality. 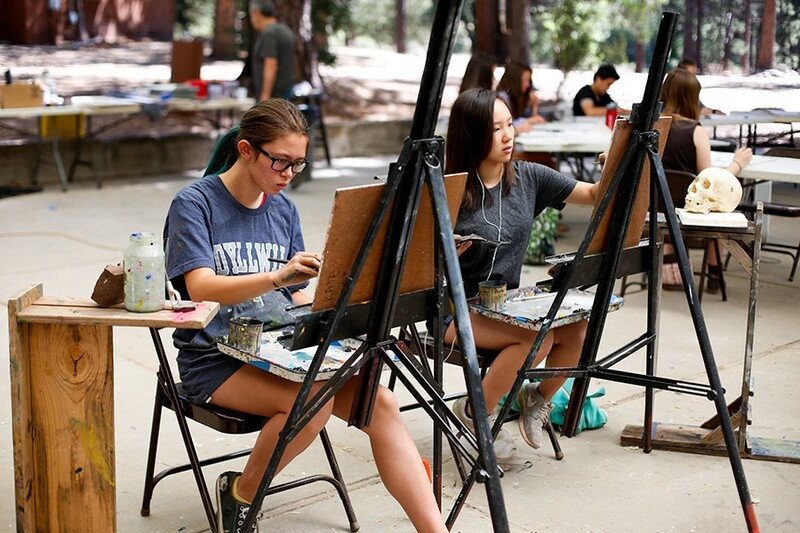 Intensive II will also focus primarily on using oil paint. Consider Intensives I and II to be interchangeable but with different instructors so that you benefit from different perspectives. Open to all visual arts media, Intensive III is for advanced students planning to pursue art at the college level. You will produce a body of work that represents your technical abilities and demonstrates an understanding of visual arts fundamentals. 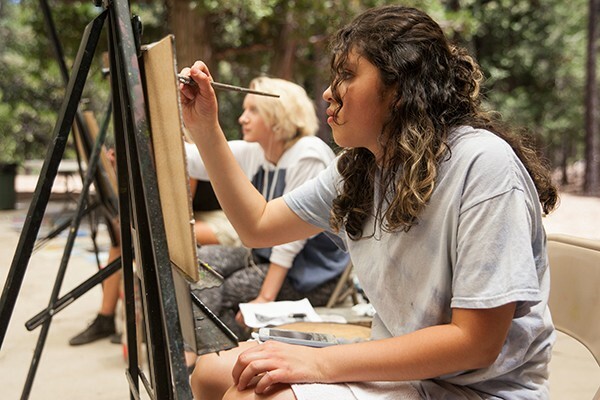 You will focus on drawing, painting, and mixed media, with opportunities to demonstrate facility and knowledge in life drawing, color theory, and composition. Plan to produce a series of paintings that will investigate an idea, theme or interest. Instructors will discuss and critique the development of your work. 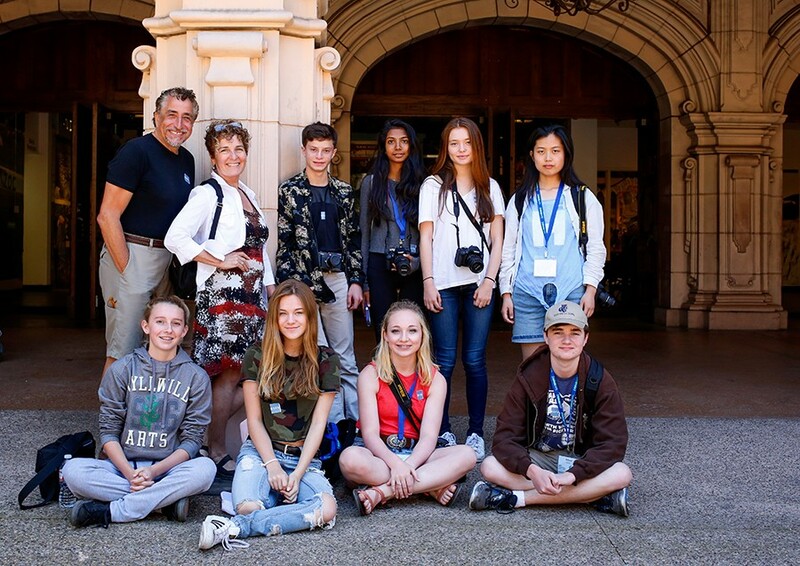 At the end of the art camp, you will have at least 12 college entrance-quality works that will be photographed and compiled into a standard 12” x 9” presentation portfolio. You also will produce a résumé and artist’s statement. 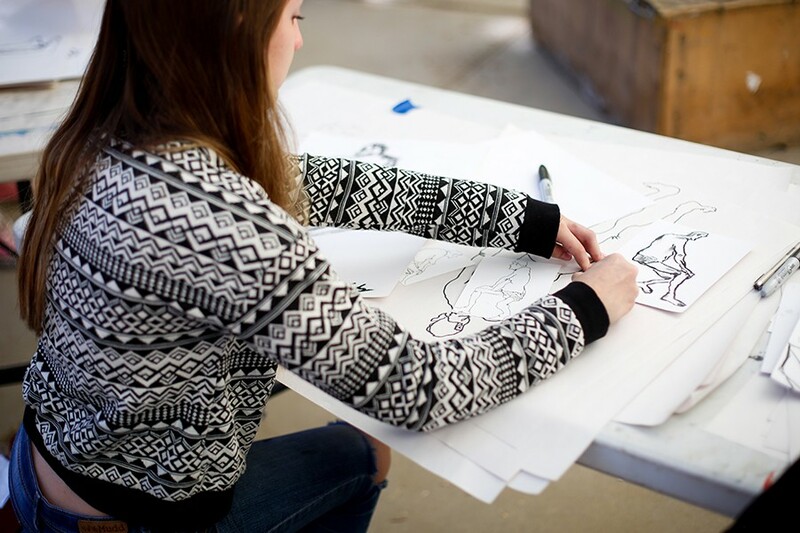 Faculty will provide application information for institutions, colleges, and universities that have outstanding or unique visual arts departments. Plan to bring a standard black portfolio case (31” x 20” or larger), two Bristol vellum pads (24” x 18”), any brushes you prefer, and optional tools such as a 35mm or digital camera. You may wish to bring completed works for inclusion in your portfolio. Create and construct one-of-a-kind jewelry. You will learn the design theory and fabrication techniques needed to make wearable art. 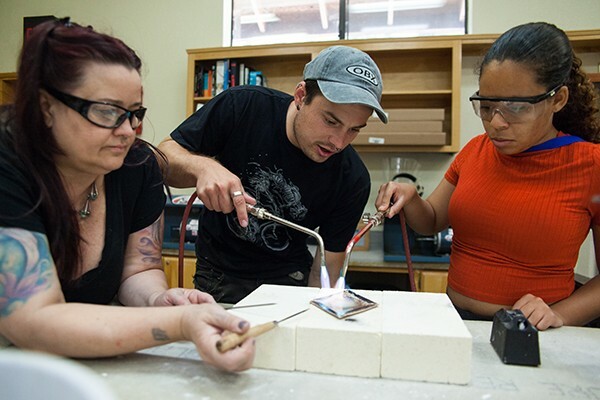 This intensive exploration of jewelry design and construction includes one-on-one instruction for both beginning and advanced students. You will learn basic soldering, sawing, forming, gemstone setting and additional techniques using found and unusual materials. 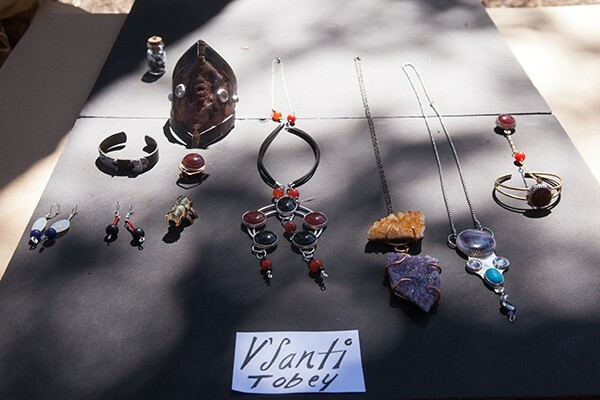 Your projects will emphasize three-dimensional design, using a combination of metals techniques to create earrings, rings, pendants, and bracelets in copper, brass, and sterling silver. Expect to explore contemporary fashion trends and timeless styles. 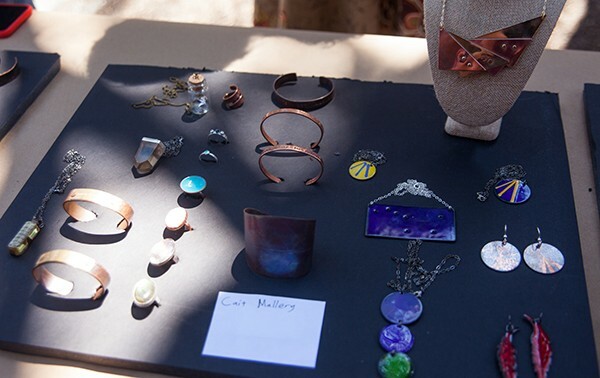 From this summer art camp, you will leave with silversmithing skills, as well as a collection of finished handmade jewelry that expresses your individual point of view. Lab fee includes the use of all tools, equipment, brass, copper, sterling silver, gemstones, and consumables such as solder, sandpaper, acetylene gas, polishing compounds, and more. The Basics – Learn all the fundamental techniques of photography from camera handling to the finished print. Introduction to the camera includes exposure calculations, image control, and learning to see. 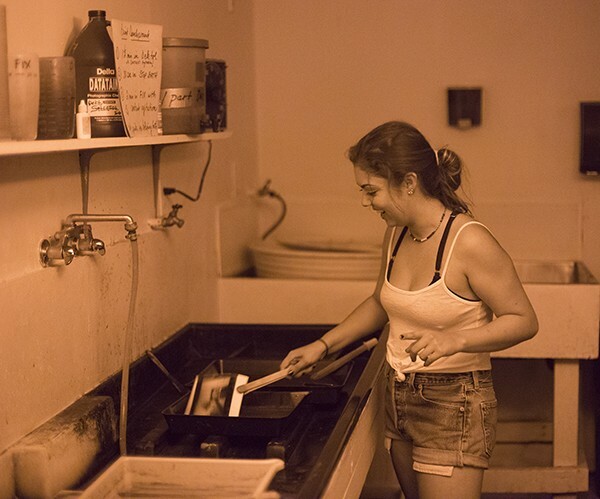 Each print will be produced in the darkroom, where you will learn how to develop film and print on enlargers. Field trips and shooting assignments are followed by extensive work in post-production techniques to enhance your images for quality printing and viewing. You will explore visual concepts in photography, such as the frame, composition, light, time and the moment. Digital Imagery – Learn how to use a DLSR camera, CS5 and Lightroom. You will learn the basics in night photography and underwater photography. Explore ways of interpreting the world through photographs so your images reflect what you feel and see. Explore the aesthetics of photography through slides, books, discussions and extensive individual and group critiques and workshop assignments. This week is designed to enhance technical knowledge and to clarify your goals as a photographer, enabling you to develop a new sense of direction and purpose. Plan to bring a 35mm digital camera and additional lens (fixed 35mm or 50mm would be best), two camera batteries plus chargers, two or more 4 GB media cards, USB, and a tripod (optional). Boarding Arts High School Academy Visual Arts Program.